As I type this we are preparing for “Titan’s” arrival of 8-12 inches of snow. I am so excited! I can’t stand it! No really…I CAN’T stand anymore of it. But I am trying to embrace this day no matter how it unfolds. Miss Courtney slept well last night and so this Mama got seven straight hours of delightful sleep. I have a feeling with the impending storm tonight may be a bit more challenging if the past two storms are any indication. But embrace it we shall. springdance from Mary Lenaburg on Vimeo. Now that I have literally blinded you with my brilliance in the art of dance, let’s move on to what I am wearing. Top is from Old Navy, skirt from Talbots, boots from DSW, tights and earrings from Lane Bryant, No makeup…oh oh oh natural baby! That’s how Jesus made me and that’s how I went to Mass. It’s that kind of day. Hmmm…I think I need to get back to basics with my dancing. Maybe Miss Julia at the Patton School Of Dance can help me. After all she is one very talented three year old. Go take a photo and join us won’t you? Head on over to FineLinenandPurple and link up. Then you can head over here to Carolyn @ CCMMCFee What I Wore to Church, Watch What I’m Wearing, celebrating modesty and fashion. 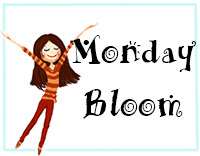 I’m also over at Sunday Style @ Plane Pretty , Tucker Up, Monday Bloom @ DC in Style and The Pleated Poppy. It’s a party! Oh Miss Amelia – things are getting desperate here. Spring needs to come and very soon or I may need to dance more and that my friend might be a problem. LOL! You are so funny! I'm afraid we are going to get smacked with snow here in Baltimore. Are you in the band that gets hammered? Miss Beth we are due for 6-10 inches of the fluffy white stuff. So very, very tired of snow. Love the dance and the song! I hope it works because I am so over this winter!!! And that prime rib looks delish! Beth the prime rib was quite delish if I do say so myself. We even have leftovers!! Yummo! As for the dance, if the snowflakes that are falling as I type are any indication, than I have lost this round. Thanks Miss Jen! I aim to please. hahahahaha, you are SO cute! Cute outfit with the butterflies and oh my goodness that prime rib looks amazing. Thank you Miss Laura. The prime rib was better than my dancing, I promise you that. LOL! Loved your little dance moves! That top is great! I'm stopping by to invite you to join my link part! 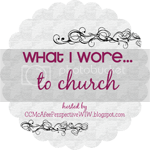 It's WIW… to church. I'd love for you to check it out and link up! Thanks Carolyn! It was a moment of silly that made the day brighter. Heading voer to join your link-up. Thanks for the invite! Love your outfit! We too are dying for spring here too. Another 3/4 inch of ice with 6 inches of snow on top was what we woke up to this morning! The first flower I see I think I might cry! Have a wonderful week! oh my friend I will be weeping right there with you. I cannot wait for the beauty of spring. please Lord may it arrive soon! Loved your spring dance! Can't wait for spring here either. Can you believe we had a windchill of -64F on Saturday? Blah! Bring on the warm! Glad to hear that Courtney let you sleep all night too. Wonderful to get even hours all at once isn't it? Hope it's the start of a new trend! Between the outfit and the prime rib, this might be the best post…ever!